Seeing as it’s festival season I thought I would make up an outfit inspired by all those festivals! Unfortunately I’m not going to a festival this year, although I do have a gig coming up later this month! In this outfit I felt the wellies are a neccessity for those muddy times and a floral headband is always needed for a little bit of hippy chic. I went for some simple shorts with a cute design paired with a spotty bralet, the shorts are high waisted ensuring those, who like me, prefer to show less flesh can. Finally some cute pearl sunglasses. 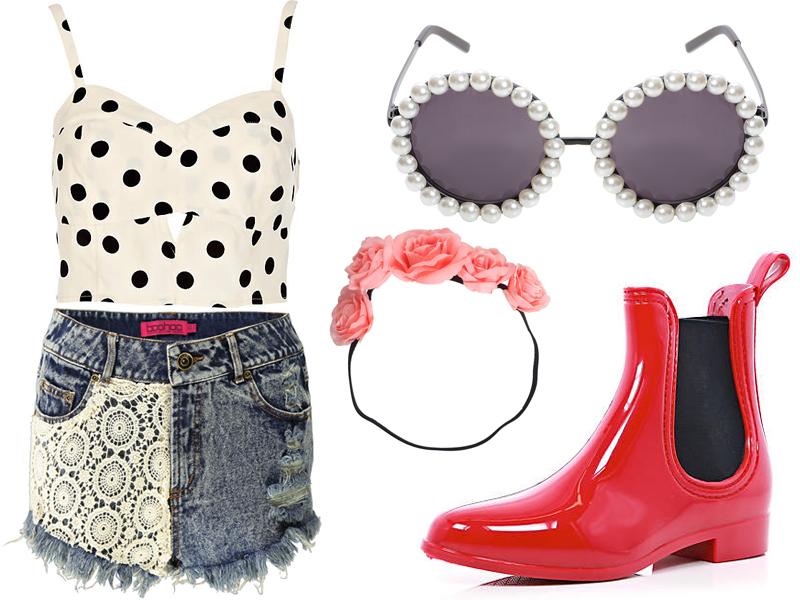 Festival wear has got to be my all time favourite style because you can really go all-out with it! I don’t quite have the confidence to wear some pieces like the extravagant headbands and sunglasses, but with festivals, you can totally pull it off and get away with it. Did anyone see Glastonbury last week? How amazing was Mumford and Sons set?